Millennials probably won’t remember Milli Vanilli, a sort-of pop duo that got into huge trouble in the late 80s for lip-syncing songs. The outcry was enormous. Fans felt cheated. They were rousted out of the music industry. What people didn’t know was that they were actually geniuses born before their time. Just ask Keenan Cahill, a US teenager who has been riding the crest of a YouTube wave for just over nine months – all thanks to his lip-syncing abilities. I confess, I hadn’t heard of Cahill until recently, but the 16-year-old high school student has taken the states by storm. His YouTube channel, on which he uploads clips of himself lip-syncing the hell out of popular songs, averages more than one million hits per day (with the average visitor watching 10 videos). It has also gained him a celebrity following, which includes Katy Perry (who declared her love for Cahill on Twitter after watching him perform to Teenage Dream), 50 Cent, David Guetta, the New York Knicks, Dynamite and Jeremih. In fact, the stars are not just fans they are co-performers, lining up to perform with the lad in his (often untidy) bedroom at home, as well as on stage, at events and on set. According to Chicago Tribune’s Joan Cary, Cahill has become so popular that he now has a manager and security guards for his weekend public appearances. What makes Keenan Cahill special? It’s a very good question, especially when you consider that there must be loads of people out there who have, at some time or another, uploaded a video of themselves lip-syncing with gusto. Having watched some of the videos, I’d say he has charm. He tackles songs with passion, even when it’s clear he doesn’t really know the lyrics. He’s also non-discriminatory, taking on artists as diverse as Pink, Michael Jackson, Britney Spears and 50 Cent. His take on Pink’s “Raise Your Glass” is rousing. Then there are his versions of “Down on Me”, the collaboration between Jeremih and 50 Cent. Five months ago he recorded the song with 50 Cent in his bedroom. He didn’t know all the lyrics, but that was ok because he succeeded in making Fiddy seem human as opposed to a misogynistic ogre. Just this month he did another version of the song, this time with Jeremih. He still doesn’t know the lyrics, but this time the effect is more pronounced because it’s shot on a set and tries to take itself a little more seriously than the Fiddy clip. Cary cites John Greening, associate professor in Medill’s Integrated Marketing and Communications programme at Northwestern University, who says that the reason behind Cahill’s success is his entertainment value. I’ll got a step colder and say that I think it has less to do with entertainment (once you’ve seen a couple of videos, you’ve pretty much seen them all), and more to do with novelty value. You see, Cahill has a rare genetic disorder called Maroteaux-Lamy Syndrome. His growth is stunted; he has to have a four-hour intravenous enzyme infusion once a week and has already had nine operations (with more on the horizon). His videos are a way to step out of himself and pretend he’s a star, which is something he’s always wanted to be. And now, serendipitously, he is. Cahill knows that his fame could be fleeting, which is why he’s determined to enjoy it while it lasts. He’s already shot an advertisement with Jennifer Aniston (he’s only in the first few seconds, but the ad is still worth a watch), and he has other ads lined up. He’s even got a deal to release a single, which he will sing himself. And then there are the movie offers which keep rolling in. His manager, David Graham, is a realist when he talks about Cahill’s long-term chances of success. He knows that fame is impossible to predict, but that what Cahill has going for him is that he’s already conquered the international market. He’s also proven to wield a fair chunk of power in the music industry. Graham says that whatever song he “records” gets a spike in online sales of between 200% and 400%. The whole family is still very grounded, however, using income from Cahill’s performances to pay his phenomenal medical bills and putting some aside for college. 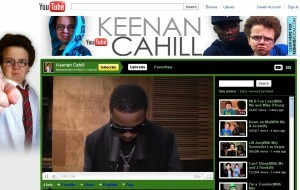 See Keenan Cahill’s YouTube channel and decide for yourself what his appeal is.